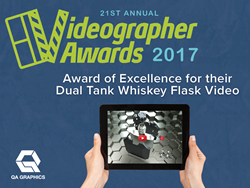 QA Graphics’ Dual Tank Whiskey Flask Video wins a Videographer Award in Video Production. QA Graphics, a full-service digital design company, is a recipient of an Award of Excellence in the Video Production/Creativity category for their Dual Tank Whiskey Flask video. To view the video visit: http://bit.ly/2tZY9CN. The Videographer Awards identify and recognize outstanding work in video production and graphic design. Winners were selected from over 1,400 entries throughout the United States and 13 other countries, with approximately only twelve percent of entries awarded the Award of Excellence honor. QA Graphics has over a decade of experience in 3D design and animation. By working with QA Graphics, Discommon Goods gained a video to be used as a tool in their marketing efforts that showcases their unique product design. Demonstrating the complexity and every detail of the flask, down to the exploding view of its156-components. This project allowed QA Graphics' 3D Design team to demonstrate their vast talents and values in quality of graphics and video production. The Flask was truly a special and exciting project for QA Graphics’ team and a fantastic way to showcase the design team’s diverse skills and talents for sales and marketing applications. As an original design collaboration between Discommon and two other unnamed international luxury brands, the digital replication and details of the product were of the utmost importance. Using QA Graphics’ state of the art rendering farm, QA Graphics’ 3D design team brought to life photos, CAD images, video clips, and schematic designs into an incredible, attention grabbing, animated 3D graphic representation. The Videographer Awards is an international competition, recognizing outstanding production and communication professionals who excel in the scope of their own environment. Winners are selected from 166 categories grouped under video production, web based production and television production. AMCP judges are industry professionals who look for companies and individuals whose talent exceeds a high standard of excellence and whose work serves as a benchmark for the industry.